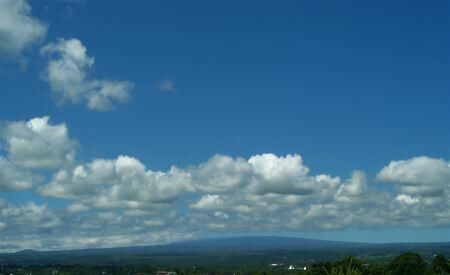 Today the clouds lifted, offering a rare view of the summit of Mauna Loa from Hilo. Erosion makes mountains steep; Mauna Loa’s gradual slope to 13,000 feet above sea level shows it is still a young volcano, what geologists call a shield volcano. But Mauna Loa grew from a vent in the ocean floor twenty thousand feet below sea level, so it is really 33,000 feet tall, and, unsurprisingly, holds the world record as a mountain for sheer cubic feet of mass. Although neighboring Kilauea volcano has erupted almost constantly for decades, making it the world’s most active volcano, Mauna Loa’s summit has expanded over the past couple of years, arousing speculation it is due to blow some time soon. I saw fire fountains on Mauna Loa through a telescope from Hana, Maui in 1975. 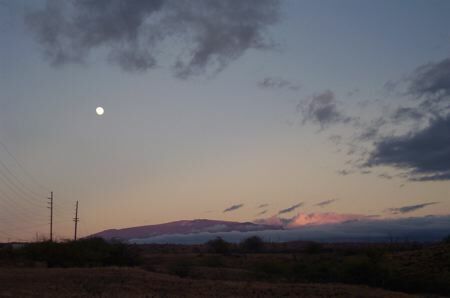 Sunset and full moon light up Mauna Kea, the tallest volcano on Hawaii Island. At the summit stand a dozen astronomy facilities from as many countries. Hawaii’s pure air and isolation from the electrically illuminated continents make it the premier spot on the planet for star gazing. This could end soon; the already huge military facility in the saddle between Mauna Loa and Mauna Kea was expanded this year to include a training ground for using weapons and armored vehicles, both of which raise dust, which is anathma to telescopes. The trainings also destroy the fragile desert eco-system and ancient Hawaiian sites in the saddle, disturb the people whose homes are in earshot, and possibly are contaminating the soil and the headwaters of Hawaii’s streams with radiation from depleted uranium in the weapons. 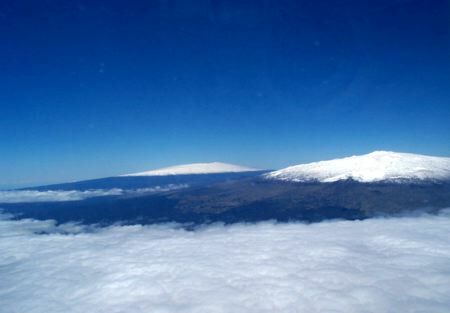 Mauna Loa and Mauna Kea from an airplane, the morning after a March 2002 snowstorm. 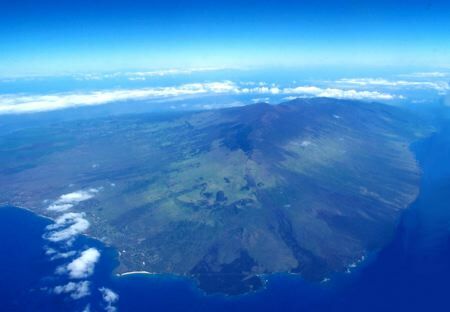 Haleakala, a 10,000 foot volcano on Maui, from the air the same day. The shoreline to the left is the Wailea resort area, the broad white beach directly below is Makena Beach. La Perouse Bay (with lava flows on both sides) is to the right, and beyond lies the coast of Kanaio and Kaupo.